Once you try a frozen drink from this margarita concoction maker you’ll wonder why you ever bothered to make Margaritas in a regular blender. The actual product name is the Margaritaville Bahamas Frozen Concoction Maker . Obviously some genius devoted his life to the science of margaritas and created this machine for all of humanity to enjoy. The reason why this machine makes such great drinks is the shaved ice. A frozen drink made with shaved ice is really smooth and easy to drink. Probably too easy for your own good. But on a hot summer day, you really won’t mind. The Margarita Concoction maker is simple to operate. It has a reservoir on top that you fill with ice. 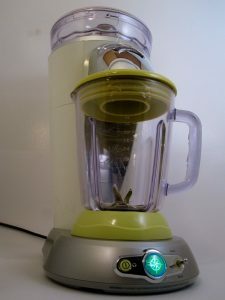 Hit the switch and the ice gets shaved and is shot down to the blender portion of the device. The cool part is that it knows exactly how much ice you need and stops shaving it at the right time.Then the blender automatically kicks in and mixes the shaved ice with the drink ingredients. If it’s needed it’ll shave more ice and continue blending until the perfect consistency is achieved. Somehow they’ve developed some sort of Margarita Artificial Intelligence and programmed it into this machine. The results are silky smooth frozen drinks with no ice chucks to clog your straws. If you’re like me you probably don’t want to spend all your time making margaritas for your party guests. You want to be able to enjoy your own party, right? Well to make life easier here’s a tip. Fill a container with the right mixture of tequila, triple sec and lime juice. Then you just fill the blender with the margarita ingredients and keep the ice reservoir filled with ice and you’re all set. Your guests will probably want to get in on the action and make a few themselves. And oh yeah, there’s even a drip catcher for any ice that melts. You don’t want that water in your drinks. So any ice that melts in the ice reservoir goes into the drink catcher which can easily be emptied. It also has manual Shave and Blend switches in case you need to override the AI. That margarita scientist really has thought of everything. And of course, you can use the margarita concoction maker to make other frozen drinks. Daiquiris, mudslides, you name it. I’m even experimenting with it to make frozen coffee drinks. Haven’t found the perfect recipe yet but I’m still working on it. So frozen drink lovers, thanks to Margaritavilla and the wonders of modern science, perfect margaritas are in your future if you buy this margarita concoction maker.